In this video we show you how to create a simple Starburst, this handy effect can be used in space scenes, reflections and modified for gleams in armour or for effects when rendering metal. International artist and master of photo-realism Dru Blair will be back this year at Airbrush Asylum. 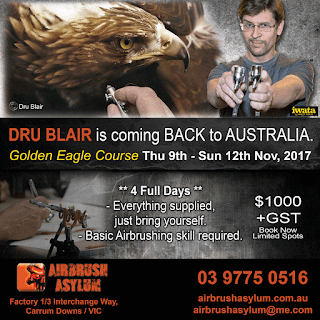 This year Dru will conduct his 4 day airbrush workshop and assist students to create a golden eagle artwork. Learn tips, tricks and techniques in Dru's four day workshop's which will help you in every aspect of airbrushing, whether you are a beginner or professional this class will provide you with information that Dru has learned over his 40+ year career. Anyone can join this class even if you are fresh out of our Beginners class, previously we have had students who had never even used an airbrush and they walked away with incredible results. To book all we require is a $300 deposit with the balance not due until November, so get in quick as spots are limited and we have already booked 10 spots at the time of writing this Blog. Classes are also available in the following locations around Australia, contact your nearest Host for dates and booking availability. Check out our latest video, Airbrush Insight : airline and bench setup. One of our viewers requested that we do a video showing how we have our airbrush bench and airlines set-up. As an answer to their request we thought we would compile this short video to showcase how we do that, so we hope that you find it interesting and maybe even helpful when arranging your airline setup for your airbrushing studio. This video discusses how to hold your airbrush, tips on mixing paint and some demonstrations on how to create fine lines with both an Iwata HP-CS Eclipse and CMC plus Micron.